Treaty Talks: Paddling Up the Columbia River for People and Salmon from Voyages of Rediscovery on Vimeo. 1,243 Miles from Sea to Source. The journey began with five logs. Five logs were carved by youth and students above Grand Coulee Dam into five Salmon Canoes, one for each of the Five Salmon. Our mission was to accomplish something that so far has not been done: return Salmon above the blockages on the Upper Columbia. As we paddled upstream, we could feel the momentum building. And not just the momentum that a half-ton dugout canoe tends to carry! As we journey up the River, at a time when the Columbia River Treaty is at a pivotal state, we listen to a conversation between shareholders of the river, a conversation that takes place on the riverbanks, at conferences and on the water itself. Ecosystem function and fish passage, ethics and science. Technicians and spiritual leaders. Not if. But When. On a three month expedition, the crew of Voyages of Rediscovery, paddled dugout canoes 1243 miles upriver from the Sea to the Source of the Columbia River. The five canoes, carved and paddled by native and non-native youth, symbolically represented Columbia River salmon. The journey honored those salmon who can no longer reach their ancestral spawning grounds of the Upper Columbia River. With looming changes in the Columbia River Treaty, we explore the possibility of fish passage and vitality of a functioning ecosystem. This documentary highlights the positive efforts of Columbia River citizens who are working to restore historic salmon runs above the Grand Coulee Dam. We have made it to the Source! After miles and miles of paddling and talking with amazing people all along the Columbia River we have made it to the source at Canal Flats. These last miles are some of the hardest. Heavy currents make it necessary to pole or line the canoes up rapids and drag them across gravel bars. We reach the headwaters of the Columbia and realize that we must continue down the Kootenay and back to Columbia and Kettle Falls. Sea 2 Source Episode 6: The Current and the Source from Voyages of Rediscovery on Vimeo. We have made it to the Source of the mighty Columbia River. 1243 Miles, and three months it has taken us. Heavy current, and long lakes. Still, glassy water, and six-foot whitecaps. We have paddled this far for the People and the Salmon. We can not give enough thanks to all of the people who supported us along the way, and were always fired up and excited about the Journey. 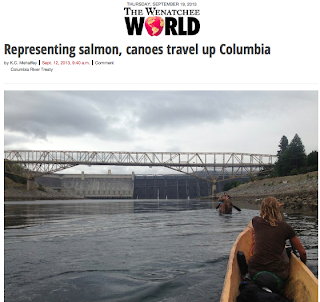 The story doesn't end here, there are still Salmon that need to be brought over the dams, and many more canoes to be built on the Columbia River! We have paddled across the border and into Canada. Through three more dams and 300 miles north we make the Big Bend to the south. A fair wind pushes us across Kinbasket Lake to where we will begin to feel the current. Sea2Source Episode 5: Kettle Falls to Kinbasket Lake BC from Voyages of Rediscovery on Vimeo. As our five dugout canoes are returned to the Schools where they were spawned, we are faced with the need for a new Canoe to Take us to the Headwaters of the Columbia in Canada. We model our new canoe on the design of the explorer and trader David Thompson, and build a 22 foot Cedar Plank Canoe, as he did when he was faced with inadequate materials for a Birch Bark Canoe. We paddle into Canada with Senixt Youth from Inchelium, returning to their Land in the Crying Salmon dugout canoe that they built. After paddling up rapids with the youth and the community, we find ourselves on our own on the Arrow Lakes with another 450 miles of windswept reservoirs and heavy current ahead of us... Canoe Canoe! S2S Ep 4 Where the Salmon Stop from Voyages of Rediscovery on Vimeo. We have traveled as far as the Salmon can currently swim up stream. Now we are paddling on water that Salmon have not been able to reach in over 50 years. We pass by Chief Joseph Dam up Rufus Woods Lake to the famous Grand Coulee Dam. At Two Rivers we meet students from Wellpinit who carved the Salmon Savior canoe, and we paddle to Little Falls, the great fishery on the Spokane River. Sept. 12, 2013, 9:40 a.m.
Sea2Source Episode 3: The Hanford Reach from Voyages of Rediscovery on Vimeo. The Hanford Reach. One of the last free flowing sections of the Columbia in the Untied States and the last great spawning ground for salmon on the Main-Stem Columbia River. After passing through the Hanford Reach we paddle past 5 dams that have included fish passage. We soon run into the end of the line. This expedition in support of fish passage to the Upper Columbia River has been ongoing with no outside funding our support financial, logistical and physical (paddling) comes from you! So please consider donating to extend the expedition into Canada and beyond! If you would like to make an online donation you can use paypal or send a check to: PO Box 852 Index, WA 98256 (we will be forwarding our mail). You can contact us on the river via email or phone. Or you can donate food, equipment or anything else you think we may value while traveling up the Columbia River! We also need Paddlers! Come on out and paddle up the Columbia River with us in honor of the salmon who can no longer reach Kettle Falls and the upper fisheries! Sea 2 Source Episode 2: Astoria to Hood River from Voyages of Rediscovery on Vimeo. On August 2nd we left Astoria, OR on our journey to the source of the Columbia River. 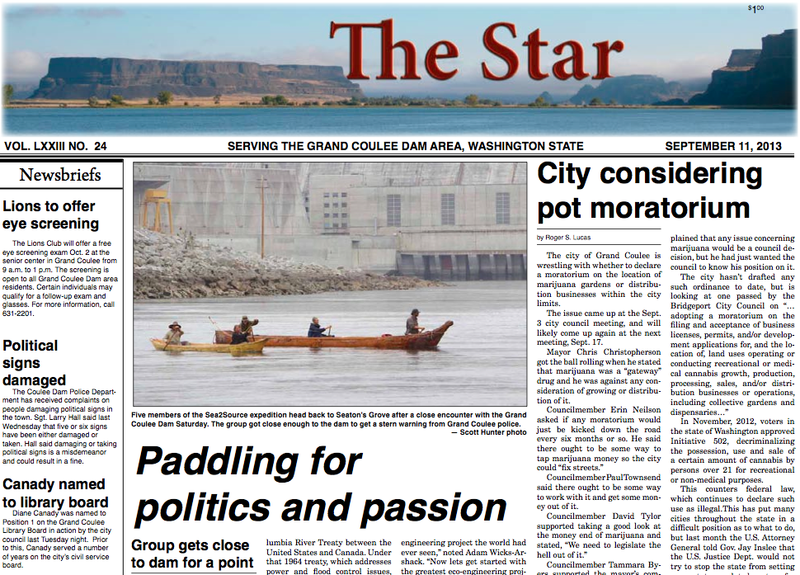 We are paddling for the Salmon and for the people of the Columbia River. We are paddling to get some fish passage over Grand Coulee and Chief Joseph Dams, and to bring the Salmon back to the Upper Columbia River. Follow us at facebook.com/VoyagesofRediscovery, and if you are interested in donating for a DVD or even a paddle that has traveled this journey with us, you can send an email to xander@theriverschool.org. Great News! What an Honor! Paddle for Purpose! It feels great to be recognized for all the hard work we have been doing. Building canoes with youth, paddling with them on the Columbia River in the canoes they built! Please follow the link at VOTE! Things had a way of working out in 2012 for outdoor educator Adam Wicks-Arshack and his colleagues at Voyages of Rediscovery, a Washington-based nonprofit. 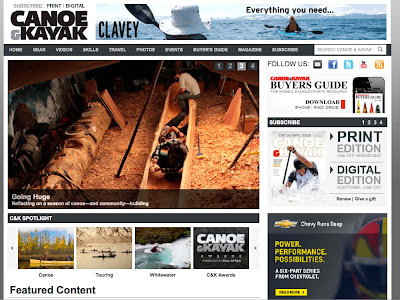 Last spring, CanoeKayak.com first reported on their KickStarter campaign to reintroduce aboriginal youth to birch-bark canoe-building on Ontario’s Lake Temagami. Having achieved their fundraising goal of $10,000, Wicks-Arshack, and fellow environmental educators John Zinser and Dan Cassell traveled across the country from their base on Washington’s Columbia River to Temagami in May and set up camp near the baseball field at the Ojibwa reserve on Bear Island. Just when they thought they might have to import bark for the construction project, a local craftsman showed them a secret stash of suitable birch. In the end, the team constructed two canoes with the help of native youth, parents, elders and the greater Lake Temagami community. Designing a HUGE Dugout Canoe! Designing a HUGE Dugout Canoe from Voyages of Rediscovery on Vimeo. This is the Inchelium School Canoe. It is a 33'3'' western red cedar which began as a 10,000lb log. It is being transformed by the students of Inchelium into a beautiful canoe for the Upper Columbia River. Another Maiden Voyage - The Feather Fox Sockeye Canoe, a set on Flickr. A 23ft. white pine dugout canoe carved at Mission Point overlooking the now flooded historic Kettle Falls. Barter Faire as Experienced by Voyages of Rediscovery from Voyages of Rediscovery on Vimeo. One canoe, Three days, great music, delicious food, and beautiful people! Thank you everyone for all the help! Thank you to Dylan Fischer and his class from The Evergreen State College for a great trip last week on Banks Lake! What a sight to see five big canoes out on the water, paddling together and packed with people and gear. We couldn't have asked for a more beautiful morning to set off on, and we took our time getting to lunch, darting in and out of some islands, and rafting up for lunch. Our lunch beach offered an opportunity to explore the rugged landscape left behind after the torrents from the Great Missoula Floods receded from Grand Coulee. As we paddled after lunch to our campsite, we paddled along cliffs at an elevation where the ravens would have been soaring if Banks Lake had not come into existence. Some rivalry sprang up between the Goat and River canoes, but the Goat-People couldn't overcome the spirit of 'Merican Dreamin' in a few impromptu drag races. The air filled with various canoe songs, we paddled into camp, and unloaded the gear we would need for the night. Dinner of burgers and stir-fry was followed by a seminar Session on the Columbia River and a talk by Churchill Clark on his journeys traveling the trail of Lewis and Clark, and paddling dugout canoes. Unfortunately we were unable to have campfires on the beach due to regulations, so everyone turned in pretty early in preparation for the day ahead. After breakfast in the morning, the class went on a walk to investigate a cave in the riverside cliff-band, and check out the ecology of the sage brush steppe that appeared to have burned earlier this year. When the class returned the guides had the canoes loaded and everyone piled in for an all too soon return to the boat-ramp. We had a great time with everyone, and it's always fun to have a whole class out on the water. We're looking forward to seeing some familiar faces in the spring time, in our canoes, or at a guide training event somewhere! Finishing the Tyee Salmon Canoe, a set on Flickr. This is the Kettle Falls Dugout Canoe! Thank you Kettle Falls for all of your support! Photos of the last couple days carving on the Tyee Canoe.